GUANTANAMO BAY NAVAL BASE, Cuba — Military judges in a Guantanamo war crimes court pressed forward Monday with hearings for five men accused of orchestrating the Sept. 11 attacks and for a Canadian accused of killing a U.S. soldier. Several days of pretrial motions started a day before the inauguration of President-elect Barack Obama, who has said he will close the offshore prison at the U.S. Navy base in Cuba. The hearing for the Sept. 11 suspects began like many previous ones, with translators struggling to keep up with the legal skirmishing and the occasional rambling outbursts from the accused as the judge repeatedly warned the men not to interrupt. "We did what we did; we're proud of Sept. 11," one of the defendants, Ramzi Binalshibh, announced at one point. Two of the defendants, Khalid Sheikh Mohammed and Ali Abdul Aziz Ali, asked that military lawyers be removed from their defense table. The uniformed lawyer, Mohammed said, represents the "people who tortured me." The judge directed the attorney to move farther away from the defendant, the alleged architect of the attacks, but did not immediately rule on the other man's request. Lawyers and representatives of human rights groups who came to observe the hearings believe Obama will suspend the military commission system created by Congress and President George W. Bush in 2006 to prosecute dozens of men held at Guantanamo. Many doubt the U.S. will go ahead with the Jan. 26 trial of Canadian Omar Khadr, who is accused of killing an American soldier with a grenade during a firefight in Afghanistan in 2002, when the Toronto native was 15. "This system is discredited and flawed and should not exist one day more, and certainly the signals that we hear from Washington, from the Obama transition team, are that he will act on it as soon as he is in office," said Jamil Dakwar, a lawyer with the American Civil Liberties Union who is in Guantanamo this week to observe the hearings. Obama's nominee for attorney general, Eric Holder, in his confirmation hearing echoed a major criticism of the commissions: that they lack sufficient legal protections for those charged. He said the detainees could be tried in the United States. Those statements make it unlikely that the commission system will go forward, said Navy Lt. Cmdr. Bill Kuebler, Khadr's Pentagon-appointed lawyer. "It is simply unimaginable to think that these proceedings would continue when you have an administration that is on the record saying that so clearly," Kuebler said. 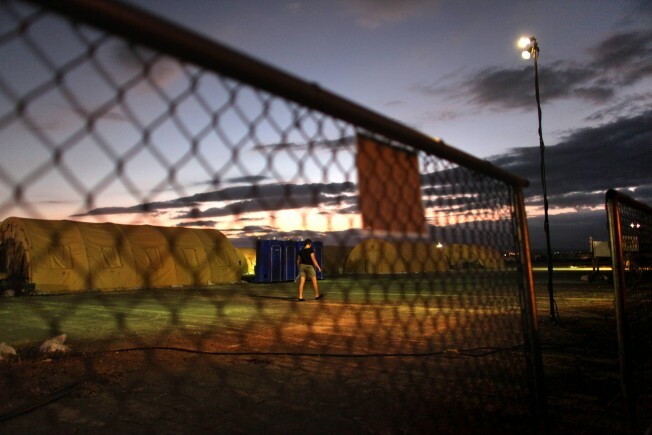 "What's very clear ... is that they want to take a different course of action on Guantanamo." The Pentagon's chief war crimes prosecutor, Army Col. Lawrence Morris, said he did not know what the Obama administration would do and had to plan as if the commissions would go forward. Still, prosecutors joined with the defense in asking military judges to postpone this week's hearings until after the inauguration. The judges rejected the request. At Monday's hearing, the judge acknowledged doubts about the future, saying one legal matter could be addressed "at later sessions, if later sessions are scheduled." In the Sept. 11 trial, a key issue before the court is whether Binalshibh, a Yemeni who is accused of being a key lieutenant to the alleged architect of the plot, is mentally competent to adequately participate in his defense. His military-appointed lawyers argue they need more information, including testimony from guards and medical personnel who have interacted with him at Guantanamo, to help them determine if he is mentally fit to stand trial. Before the court can delve into that issue, however, the judge will consider whether the Pentagon must charge and arraign the men all over again after it withdrew and refiled charges in about 20 cases. The Pentagon described the refiling as a procedural step required to appoint new military jury panel members. That same issue must be addressed in the Khadr hearings, which will include a defense request to suppress statements by the Canadian that his lawyers argue were obtained through torture and coercion. The military says Khadr's statements were not the result of torture but of "conversational and non-coercive interviews."